Audio problem: Anthony Hopkins is in his car with Cogman, discussing Pangea the super continent over the phone with John Turturro. There are two instances in this scene in which Anthony Hopkins' voice has been dubbed over by a different actor that does not sound like him. Anthony Hopkins first says "That's Pangea. The super continent." The scene then flashes back to the round table and the dubbed voice attempting to sound like Hopkins says "It's the same shape on the round table." The dubbed voice is heard again when he says "Genius", before reverting back to Anthony Hopkins immediately after when he says "Stonehenge." Continuity mistake: When Anthony Hopkins is on the phone with John Turturro, an Autobot approaches the phone booth he is standing at to talk to him, and stands in front of the phone. A few seconds later, the Autobot starts to walk away by walking forwards. The shot cuts to Turturro telling the Autobot he'll be five minutes, and it has suddenly vanished from in front of the phone booth. Factual error: The finale takes place at Stonehenge. It is shown surrounded by woods, not in an open plain as it really is. It is also missing a security fence, dyke, a main road and visitors' car park. There are also hills, whereas Salisbury Plain is quite flat. 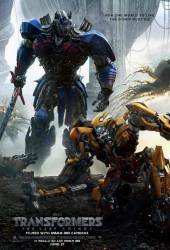 Trivia: The previous two "Transformers" films both earned over $1 billion worldwide at the box office, and this fifth film was considered such a guaranteed hit, nearly a dozen more films set in the "Transformers" universe were planned before its release. However, the movie ended up bringing in the lowest grosses of the entire series, and has as of July 18, 2017, only brought in just over $500 million worldwide- only half of what the previous two films earned. Trivia: The dog that Anthony Hopkins is shown walking at his estate is played by a dog named Freya, a dog diagnosed with epilepsy who had been described as Britain's Loneliest Dog, after being cared for by an animal centre for six years, her entire life, and had been overlooked by 18,000 potential buyers. Daytrader: You always resort to violence! Sir Edmund Burton: It has been said throughout the ages, that there can be no victory, without sacrifice.